The city of Paynesville received a $2,500 grant from CenterPoint Energy Minnegasco last week. Paynesville was one of six communities in the state to receive a grant for public space beautification this fall. Six other communities received grants for public safety equipment from CenterPoint Energy Minnegasco, which launched the grant program in 2003 and has awarded $106,070 to 45 cities so far. 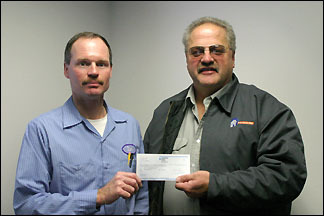 Public works director Ron Mergen accepts a $2,500 check from Keith Hemmesch of CenterPoint Energy Minnegasco last week. Public space beautification projects include park enhancements, main street beautification, tree planting and landscaping projects; and trail improvements. Public safety equipment includes self-contained breathing apparatus and specialized emergency response and rescue equipment. The city of Paynesville intends to use the grant as part of $19,000 in improvements to the BMX park.